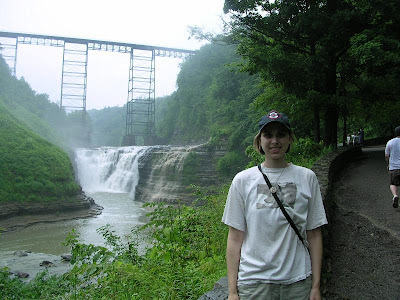 On Saturday we took a trip south of the Thruway (I-90 to those of you not in the know) to Letchworth State Park, called by some the Grand Canyon of the East. 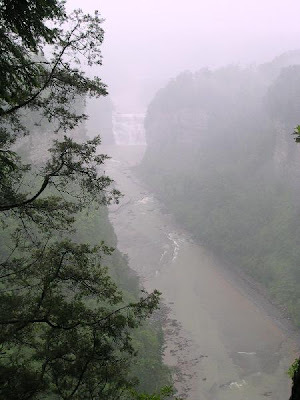 The Genessee River flows through a series of gorges and down several waterfalls on its way north towards Rochester and Lake Ontario. 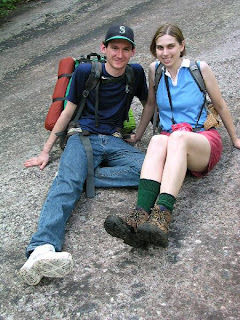 Our original intent was to go on a nice, vigorous day hike, and to get out of the house for a day. The forecast was for possible thunderstorms and rain, but since the weathermen have been saying that a lot lately, and have been wrong a good portion of that time, we figured we were safe. And even if it rained, we both felt a desperate need to get out of town for a bit. It did rain in Brockport before we left, and rained on us for part of the drive, but when we first arrived in the park it was clear and dry. That didn't last long. As you can tell from the first two pictures, it rained. A lot. We decided to eat our lunches and hope it would pass quickly, as most storms around here do. Not this one. We ate in a picnic shelter, along with a family of Korean tourists taking refuge from the rain. Although the rain hadn't stopped, we decided to push on towards the trail head we wanted. 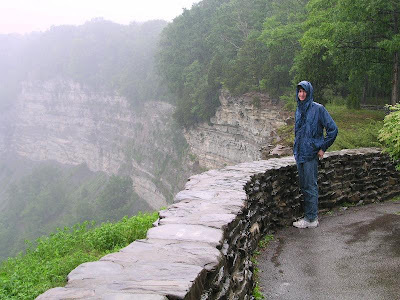 We braved the rain to take in the (misty, rain-covered) views, and to get soaking wet. The rain stopped eventually - not before we were both too wet to want to go for a long hike. Benjamin, in particular, had wet feet after mistaking a diguised puddle for solid ground. Oops. 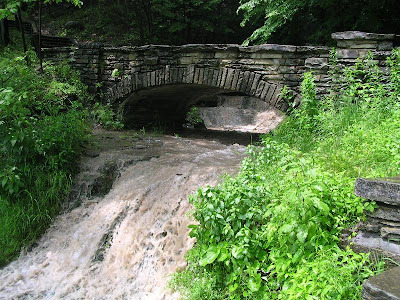 You can see the magnitude of the rain in the rushing rivulet above. Anyway, the rain did abate and the sun came out as we reached the final parking lot and the trails to the falls. This picture doesn't really do the falls justice. While I would hesitate to compare the gorges and falls to the Grand Canyon (I mean, there really is no comparison if you have actually seen the GC), they were quite scenic and lovely. There are three sets of falls, and apart from the railroad bridge and rock walled trail on the one side, there are no other human intrusions to mar their beauty - unlike Niagara Falls with all the casinos and such. The flora is very lush and verdant, and had it not been so humid and wet, I am sure we would have enjoyed going on the hike. As it was, we had a really good time, despite the wet feet, and if we didn't get our hike, we did get out of the house and town for a while. Thanks to my mother's persistence and a local antique shop's diligence, I now have a really big bread bowl. 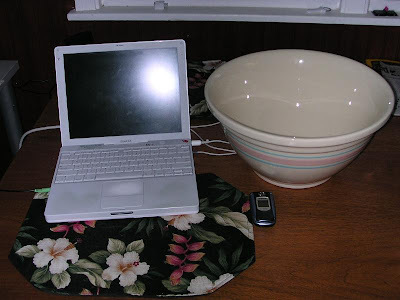 You can see from the picture just how big it is, when compared to my laptop and cell phone. Now I should have no worries about my sourdough starter trying to escape or my wheat bread trying to take over the world! 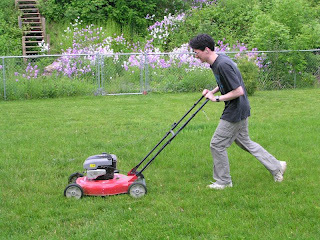 I was going to title this post "I hate moving," but when I googled that term, there were already a ton of blogs about that out there. But I do. Hate moving, that is. Trying to figure out where to live once you move, how to move (u-haul, moving company that wants lots of money and time, sell everything and start over). That is the stage we are at. People keep asking me if I am getting excited yet, or if we have a place to live yet. No. I am not excited about packing up my house for the second time in under a year, and driving over 1000 miles with 3 yowling cats to move to a new town where I know no-one and don't know where the grocery store is. It just isn't that fun. I know it will be fine once we get there, but until we do, it is not fun, it is just a lot of work. I bring up tennis because we took advantage of the lovely weather yesterday to play a couple of sets, and because Wimbledon has started. We are casual tennis watchers, but we do follow it, especially at Wimbledon. Ah, grass court tennis - will Rafael Nadal finally beat Federer somewhere other than on clay? Will Serena or Venus pull out another title? Will Andy Roddick finally live up to some of his promise? Who knows - all will be reveled over the next two weeks. According to my Old Farmer's Almanac, Wednesday's full moon was the Strawberry Moon. That is appropriate, for late June has always been strawberry time for me. Just as the seasons are turning from spring into summer (and the solstice is today), the strawberries come ripe and ready to pick. 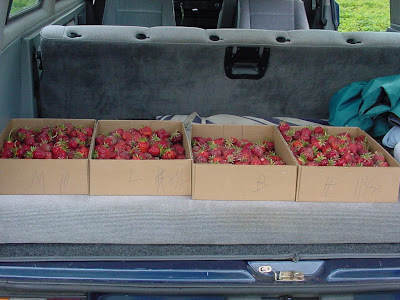 Every year while I was growing up and living at home we would go out to Carnation to a preferred U-pick strawberry patch and load up. The first time I took Benjamin along he commented that my dad and I could be migrant workers, for we picked so quickly and accurately. The day before our wedding we picked 60 pounds of strawberries in an hour or so. I found it profoundly disorienting when we moved to Texas and discovered that strawberries are ripe in March and early April. 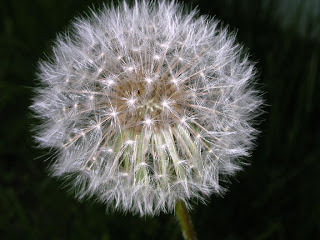 While it fit the seasons down there, it did not fit my ingrained, accustomed pattern of the year. And strawberries just are not natural in such hot, dry climates.They prefer sun, but sun mixed with cool rain and clouds. Brockport, however, is much more like Seattle, and it is now strawberry time. And so, we are going to go pick strawberries tomorrow - although I doubt we will get up to 60 pounds! (for one thing, we don't have an extra freezer to store them in, and for another, we don't have a wedding reception to stock.) There isn't much that can beat a fresh strawberry (except maybe a homegrown tomato, but not much else). 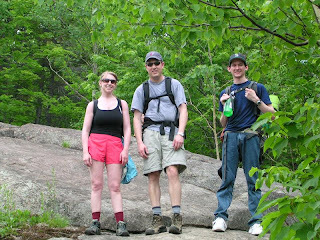 This past weekend, Benjamin and I drove to Albany to visit with Catherine and Morrie and to go hiking with them in the Adirondacks. We were really looking forward to it, since it has been far too long since we have had a chance to go backpacking. We had one minor problem on the trip - a disintegrating backpack, as seen above. I have had that backpack for close to 20 years probably, and during our last small backpacking trip, the part of the pack that held the shoulder straps onto the body of the pack snapped into two pieces. On Thursday night, we rigged what we thought was a very clever fix to this problem by sewing the two pieces together with twine. On Saturday, when Benjamin lifted the partially loaded pack out of the car, another area of the same rubber/plastic piece fell apart. At this point, it was the backpacker's friend - duct tape - to the rescue. Not the most elegant or comfortable solution, but it got us (well, Benjamin, since he had to carry it) through the trip. 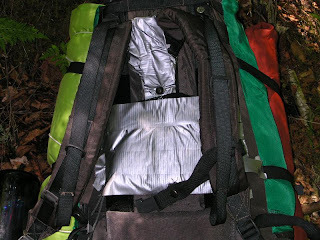 For our next trip, we will be taking a trip to a camping store to get a new pack! Here we are, relatively early into the long slog that was the trip up to Big Slide. I have really only ever gone backpacking on the Olympic Peninsula, where the terrain is relatively flat, apart from headlands. The hardest part of the hike there is slogging through sand or avoiding fast rising tides. So, while I was intellectually aware that we would be hiking UP mountains, I was not quite prepared for the amount of actual up climbing to be done... I am really quite a wimp when it comes to up, but I made it, without too much whining. And it really was worth all the climbing, aching legs, sore feet, and humidity. The forest was wonderful - mostly empty of people, quiet except for the sounds of birds, running water, and wind. The views were spectacular. The flowers were lovely. 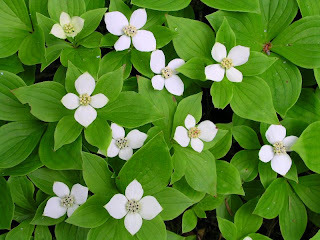 The above are bunchberries ( Cornus canadensis), which are related to dogwoods. They were all over - if I hadn't been with other people who actually wanted to make some progress, I could have spent hours taking pictures of them. We also learned about another vital part of the Adirondacks hiking experience: the black flies. When I mentioned where I was going over the weekend to people at work, they all said "Ooh, take some bug spray, and good luck with the black flies!" Catherine assured me that bug spray wasn't really necessary, and I didn't want to have to carry it, so I ignored the advice. For the first part of the hike, it seemed that I was fine. And then, we reached the fork in the trail where we were to leave our packs and climb up a bit higher to the top of Big Slide. As we took our packs off and rested, we were suddenly swarmed with flies. Little black ones that began to bite. A lot. As we went up, we passed another group of hikers coming down - two of whom had silly looking hats with netting hanging off of them - and we traded pleasantries about the day and jokes about the flies. We weren't laughing much as the flies got thicker. After a bit I was just too pooped to go on, so I stopped at an overlook point to eat a snack and let the others go on ahead. Within two minutes I desperately wanted one of those silly looking hats. I had to pace, rather than sit as I really wanted to do, to avoid the flies. Then, I had to start flapping my bandana and slapping myself all over to get the flies off. When the others returned to my "resting" spot, I headed back down to the packs as fast as my legs would go. When Catherine and Morrie paused to put on long pants and shirts, I just took my pack and started booking it down the trail in the direction of our eventual evening stopping place. Benjamin had to run to catch up with me. I didn't stop until I was away from the swarms and could open my mouth without fear of one flying in. Whew. Now I am covered (as was everyone else) with bites, but the trip wouldn't have been the same without them. I can say I have had the authentic experience. And, if I ever get a chance to come back, I will bring one of those hats! We spent the night in a lean-to. 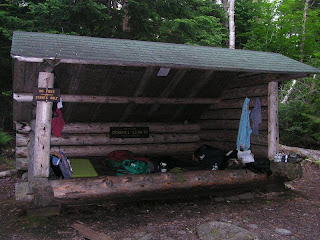 I couldn't exactly see the point of them until we actually arrived at it, because I am used to camping with a tent - but when it started raining and all we had to do was retreat under the roof, I sure appreciated it. And getting ready to leave in the morning was a lot easier without having to wrestle with a wet tent! We ate dinner, played some cards, and flopped, exhausted, into our sleeping bags. The next morning we tackled another peak, hiked out, stinking, sore and tired, but with a great feeling of accomplishment, and celebrated with lunch at Catherine and Morrie's favorite diner. Ahh! Wilderness! 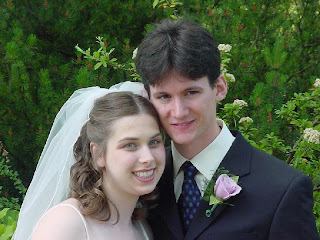 Today is our 7th, yes 7th!, anniversary. We have now outlasted many celebrities, and plan to keep going for many, many years to come. No, we aren't tired of each other yet. The bottom picture is from our weekend hiking trip. More pictures to come later today. The Mariners finally fired Bill Bavasi, their GM. I have been against him since they hired him, and am relieved that he is gone! Maybe now the team can start fixing some of the problems that have left them as the worst team in the major leagues. In other news - I will be posting about our weekend trip in the next day or two, once I have a chance to get pictures off the camera. To whet your appetite: there will be tales of black flies, broken backpacks, great views, and boots. Great Outdoors, here we come! Sorry for the relative silence this week - to be honest, nothing interesting has happened, apart from the bunny sighting in the back yard on Tuesday night. 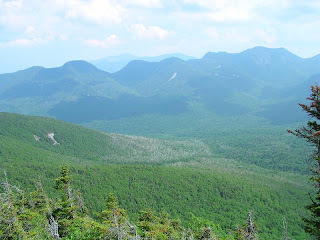 But, I should have some interesting pictures and tales to recount on Monday, for this weekend we are joining Catherine and Morrie in a trek through part of the Adirondacks. Neither of us has been hiking in quite a while and we are looking forward to it. Last night we managed a bit of nifty repair work involving a Leatherman and butcher's twine on our one and only backpack, which broke the last time we went hiking at Enchanted Rock. Hurrah for a backpacker's ingenuity. I will try to remember to take a picture of the fixed backpack for next week. So, have a good weekend, and I'll see you on the other side (assuming I don't get eaten by a bear or rabid woodchuck)! 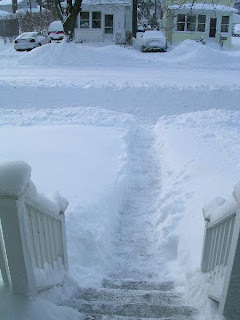 This was the view out our front door 3 months ago. How I wish it were the view today! I know that Seattle is in the midst of a colder than normal June, but we here in Brockport are in the midst of a heat wave - it has been near or above 90 every day since Thursday. At 9:30 this morning it was already 81, but felt like 87 thanks to the humidity. Where are we, Texas? Arkansas? We got used to the heat in Austin, but here our bodies haven't had a chance to adjust yet, so we are particularly miserable. I know this is what I have to look forward to when we get to Conway, but I was hoping to at least enjoy a cool summer until we move! I know I was sick of it back in March, but I miss the snow! After 6 years in Austin, I thought I knew about humidity, but I was wrong. In Austin, when it is humid and yucky outside, it is usually hot enough to have the a/c on inside, so you can escape. That means it is unpleasant, but bearable. Last night, it was humid, really humid, but not really hot enough to keep the a/c on all night. As a result, it was like sleeping in wet sheets. Ugh. At least it is supposed to be hot today, which means we will probably have the a/c on. Too bad we don't have it in the car any longer. Here are a couple of flowers for Friday. I don't know what either of them are, but they are both on the berm of the canal out back of the house. The top one is all over in the wooded areas bordering the canal. 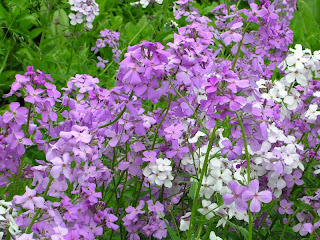 It is really long lasting - the ones out back have been blooming for a couple of weeks, at least. The other one is growing on the fence in the yard. 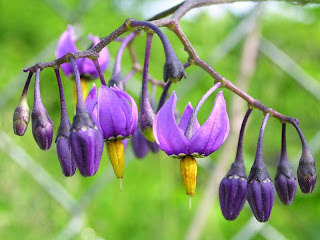 It is very tiny - the pictures make it bigger than it is - the blooms are smaller than a dime. We did a bit of gardening this past weekend. I finally got out to a garden center/nursery and bought some herbs - cilantro, oregano, and basil. 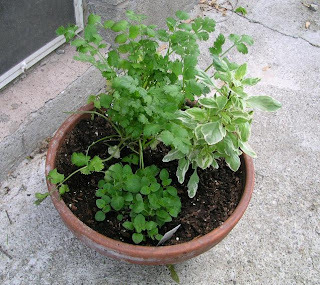 The cilantro is a new attempt, but the oregano and basil are standards of my garden. I also have a little planter with some basil sprouts attempting to grow - I may have started them too early, and they may just not get going enough. We'll see. I also have a planter full of lettuce. I was never able to get this to work back in Austin - too hot, started to late? Who knows. It is working here so far. We have been able to use some of the leaves in a salad once, when I thinned. I think it is ready to be thinned again this week. 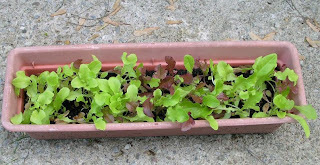 A salad made from fresh lettuce is one of the great things about gardening. Especially if you can also have a homegrown tomato with it. Alas, I won't be growing tomatoes this summer - we have to move before they would get anywhere, and it will be too hot in Arkansas when we arrive. Sigh. Some day I will have a garden with more tomatoes than I know what to do with, like my dad! We've got two months left here in Brockport. Where has the time gone? It seems like we just got here, and that we were just waiting for the snow to arrive, and then to leave. Now it is June, sunny and warm, and we will be packing again soon. Goodness. So, if you want to come visit us here in NY, better get moving!